Facebook Finally Catches Up To MySpace In The U.S.
It’s over. 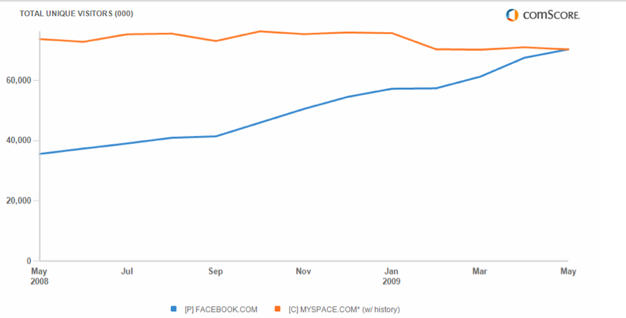 Facebook is now as large as MySpace in the U.S., according to May data released today by comScore. Facebook actually passed MySpace by a smidgeon, with 70.278 million unique visitors compared to MySpace’s 70.255 million. While Facebook passed MySpace on a worldwide basis last year, as recently as last March, Facebook was still trailing MySpace by 9 million unique visitors. In May, Facebook gained another 2.8 million unique visitors in the U.S. MySpace, which has been stagnating lately and as a result now has a new CEO, lost about 700,000 unique visitors during the month. A few months ago, it looked like it might take Facebook until the end of the summer to catch up to MySpace, but it has already done so. Don’t expect MySpace to reverse this trend and regain its top spot anytime soon. Having just successfully launched its “vanity URLs,” Facebook looks to be on the verge of another hype cycle. Just 15 minutes after the launch, a half million people had signed up for vanity URLs. And as of sometime today, some 6 million users will have apparently signed up — just three days after it launched. Practically everyone is talking about the company once again, from blogs to the mainstream media. And all this stems from a feature (vanity URLs) that MySpace actually had from the get-go. That itself seems to speak to how over this game is. And when you reverse the situation —MySpace recently launched a site-wide IM toolbar, that looks a lot like the one Facebook had — basically no one talked about it.